An offbeat metaphor machine in VR. 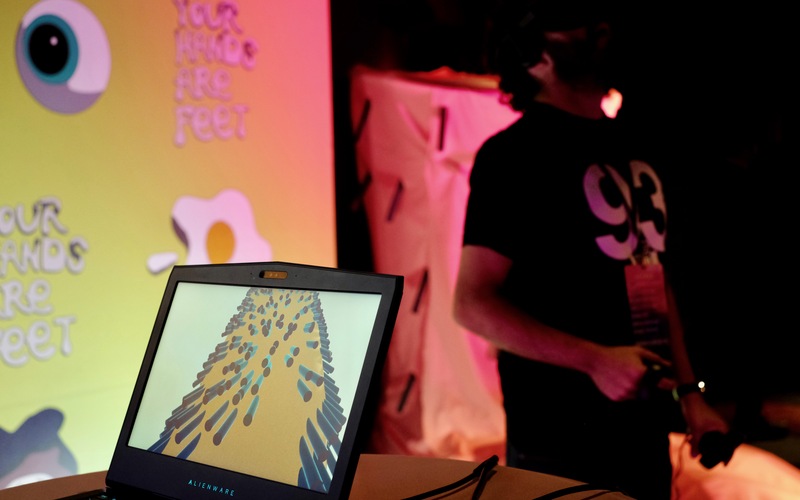 The interactive experience Your Hands Are Feet is a smorgasbord of feelings. Take the title example. Creators Amelia Winger-Bearskin and Sarah Rothberg wanted to pinpoint the feeling of shoes not fitting quite right. Ill-fitting footwear is not a catastrophe, but a mild annoyance that bugs you throughout the day. You can still get things done, but not as easily. It's as if, in their minds, their hands were feet. If it does not make sense in words, that's OK. The point of their demo -- whose first playable version debuted at the Engadget Experience today -- is that virtual reality can convey this feeling in a way that other media, like text, can't. Earlier in its development, Winger-Bearskin and Rothberg explained how they wanted to find fresh ways to describe nuanced emotions. In Your Hands Are Feet, you select a virtual egg and lob it into a portal to kick off a vignette conveying one such feeling. It's not immediately apparent what you're supposed to do, and that surprise is part of the enjoyment. One scenario places you in a surrealist kitchen -- equipped with a sink, cooker and cactus -- with feet on the ends of your limbs (you can still pick up a phone on the counter). Another surrounds you with hundreds of eyeballs, meant to evoke the sensation of seeing yourself through someone else's eyes. Or, you might end up in a window-cleaning cart with a giant pink razor, dispatched to shave a giant's leg. Lopping off its jet-black cylindrical bristles while in an oversized bathtub in the desert is satisfying, but you can never get a clean shave within the time limit. It's a psychedelic spin on a Sisyphean task that can never be completed. Other interactive metaphors include the feeling of being at "the corner of three corners" (imagining your past and future self) or that "everything has vibes" (touch the environment and your controllers will vibrate). In essence, Your Hands Are Feet is about the subjective ways we see the world. It feels like a disorienting trip into someone else's psychological structures; the weird ways we conceptualize our experiences in our heads. Each experience evokes different emotions: The infinite stretch of eyes are creepy, the giant shaving is both futile and amusing. While many VR experiences try to place participants in another person's external world, this project places you deep inside someone else's mind. The alternate reality the project presents is an internal one. Winger-Bearskin and Rothberg hope they can offer new frameworks through which people can see the world. "We're showing people these new ways of viewing the world and those ways will come up for them," said Rothberg, who teaches VR at NYU's Tisch School of the Arts. "Whenever I shave my legs now, it's like 'oh yeah, it's like there's a tiny person.'" They've made both an experience and a statement about what VR can do: describe the world in a language that's unique to the medium. Winger-Bearskin, the director of nonprofit Idea New Rochelle, founder of the Stupid Hackathon and former opera singer, describes VR as "a place where you can prototype the human experience through a computational environment." Her hope is that it can "maybe create some new ways that we can frame and communicate the way we think and feel to each other." It's commonplace now to hear of virtual reality as an "empathy machine" and the idea of creating human connection, seeing the world like another person does, is part of Your Hands Are Feet, too. The difference is that connection comes not from sharing an external environment, but understanding your own mind better. The next step is to connect with someone who sees their life events through the same metaphorical construct. "I feel like that is the way that I can step closer to empathy: if I can say 'we have common experiences,'" said Winger-Bearskin. The creators of Your Hands Are Feet want to give people the tools to convey a complex emotional state to someone else. By understanding themselves better -- even via the most obscure, Spongebob-meets-Psychonauts universe -- they can hopefully understand each other better, too. Your Hands Are Feet was made possible through funding from the Engadget Alternate Realities grant program, established in May 2017. 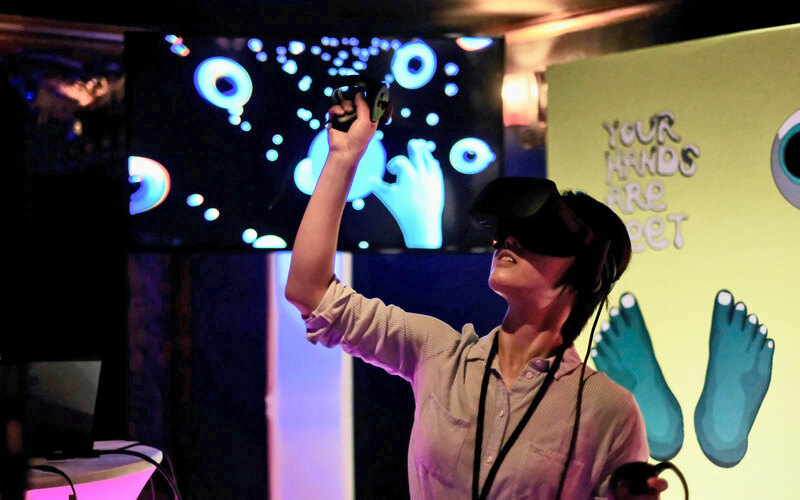 It debuted, along with four other prize-winning immersive-media projects, at the Engadget Experience on November 14th, 2017.